Constructed of Thick durable material, this is built to last. LARGE capacity. Great for Beach Towel,Notebook,MacBook,Surface Laptop etc. DURABLE. Made with Thick durable unique Polyester. Vibrant Patterns,more color choices for you. Big outside zipper pocket,convenient for your phone or others,many inside pockets for your valuables. Lightweight, compact design,Lightweight than the canvas bag. ❤High Quality Outdoor Fabric & Water Resistant - Washable,Wateproof completely,Thick high quality material,Smoothly crease-resist,with excellent workmanship. ❤Large Size & Lightweight - Dimensions with 14.6 x 15.4 x 4.7 inches (W x H x D),Lightweight at 13 OZ,Oversized. ❤Zipper Closure & Many Pockets - Durable metal zipper,[OUTSIDE]1 Big outside zipper pocket,[INSIDE]1 Big inner zipper pocket + 2 inner open pockets. 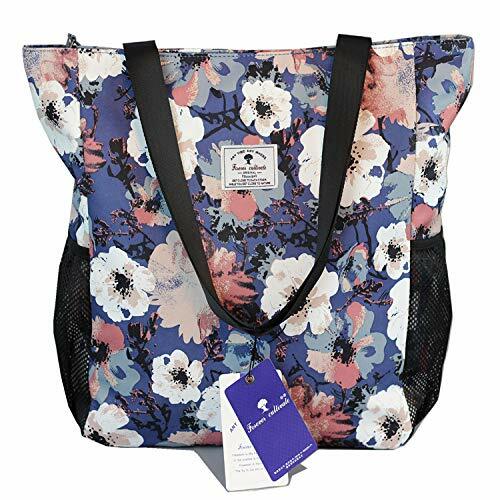 ❤Versatile Tote & A Perfect Gift for Everyone - With smoothly straps,handle-drop of 11 inches, which is long enough for most people,comfortable, and functional. It's perfect for gym, sport, yoga, dance, travel, carry-on, luggage, camping, hiking, team work, training and more! It's a fabulous gift idea for everyone. ❤Original Floral Leaf Design - Esvan cooperate with Forever cultivate Professional bag manufactor to design ideal backpack for you!Original floral leaf harajuku cute shoulder bags alternative to Shoping,School,Sport,Gym,Hiking,Travel,Yoga,Swimming,Beach etc...A lovely bag full of personality, so fresh and unique.